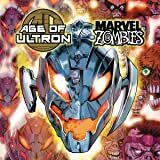 Collects Age of Ultron VS.Marvel Zombies #1-4, Age of Ultron #1. There's a place so dangerous that it's walled off from the rest of Battleworld. A place where wild zombies feast on those who've been banished for crimes against the state — where cold, mechanical Ultrons destroy anything human. 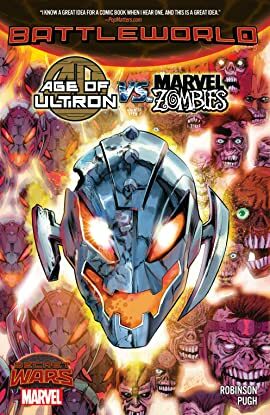 But as war rages between Ultron's robotic horde and the zombie masses, a small pocket of humanity must defend itself from both sides. Can Salvation — an oasis run by Jim Hammond, the Vision and Wonder Man — protect what little humanity resides in the "Dead Zone"? And how will the Hank Pym of 1872 react when banished to this hellish landscape? Ultron is on the verge of a breakthrough that will shake the foundations of Battleworld — but whoever wins, we lose...unless Hank Pym can deliver us from evil! The ultimate death sentence in Battleworld! There's a place that's so dangerous it's walled off from the rest of Battleworld; where wild zombies feast on those who've been banished for crimes against the state, and where cold, mechanical Ultrons destroy anything that's human. Pity those who get caught between the two, for their death won't be fast and painless!